The Puerta del Sol square in Madrid, shown here on 20 May 2011, became a focal point and a symbol during the protests. The anti-austerity movement in Spain, also referred to as the 15-M Movement (Spanish: Movimiento 15-M), the Indignados Movement, and Take the Square, had origins in social networks such as Real Democracy NOW (Spanish: Democracia Real YA) or Youth Without a Future (Spanish: Juventud Sin Futuro). and began with demonstrations on 15 May 2011 close to the local and regional elections, held on 22 May. Since the ongoing economic crisis began, Spain has had one of the highest unemployment rates in Europe, reaching a eurozone record of 21.3%. The number of unemployed people in Spain stood at 4,910,200 at the end of March 2011, up about 214,000 from the previous quarter, while the youth unemployment rate stands at 43.5%, the highest in the European Union. In September 2010 the government approved a sweeping overhaul of the labour market designed to reduce unemployment and revive the economy. Main trade unions CCOO and Unión General de Trabajadores (UGT), and minor ones, rejected the plan because it made it easier and cheaper for employers to hire and fire workers. Trade unions called for a general strike, the first in a decade in Spain, on 29 September 2010. For the rest of the year, the government proceeded with economic reforms. In January 2011, the government reached an agreement with the main trade unions to increase the retirement age from 65 to 67. Still, anarcho-syndicalist and other unions rejected the plan and called for a strike on 27 January in Galicia, Catalonia and the Basque Country. Other demonstrations in Madrid ended up in clashes. The majority of Spaniards also rejected the higher retirement age. In February the so-called Sinde law passed, adding another motivation for the protests. The law allows an administrative commission to shut down any web page that shows links or allows irregular downloading of copyrighted content, without judicial supervision, even when the courts had repeatedly declared the legality of linking to these contents. Users on Spanish forums and social networks have criticized the law, which PSOE, PP and Convergence and Union approved. An anonymous campaign, #nolesvotes, appeared online, calling on citizens to vote against any of the parties that passed the law. Prior to 15 May, other demonstrations served as precursors of the protests. These demonstrations include the 7 April demonstration in Madrid by the student group Youth without Future (Spanish: Juventud Sin Futuro), which gathered 5,000 people. Spanish media have linked the demonstrations to the 2008–2009 protests against the Bologna Process. The Portuguese "Geração à Rasca" movement was also an inspiration. According to Peter Gelderloos, the movement led to the creation of hundreds of police-free zones across the country, hospitals were occupied and saved from privatisation, neighbourhood assemblies sprang up, unused land and homes were occupied and squatted, worker cooperatives were founded and urban community gardens were established. Main article: Plataforma ¡Democracia Real YA! In January 2011, users on Spanish social networks and forums created the digital platform ¡Democracia Real YA! Using Twitter and Facebook, it called "the unemployed, poorly paid, the subcontractors, the precarious, young people..." to take the streets on 15 May in the following places (in alphabetical order): A Coruña, Albacete, Algeciras, Alicante, Almería, Arcos de la Frontera, Badajoz, Barcelona, Bilbao, Burgos, Cáceres, Cadiz, Cartagena, Castellón, Ciudad Real, Córdoba, Cuenca, Ferrol, Figueres, Fuengirola, Gijón, Granada, Guadalajara, Huelva, Jaén, Lanzarote, La Palma, León, Las Palmas de Gran Canaria, Lleida, Logroño, Lugo, Madrid, Málaga, Menorca, Mérida, Monforte de Lemos, Murcia, Ourense, Oviedo, Palma, Pamplona, Plasencia, Ponferrada, Puertollano, Salamanca, San Sebastián, Santa Cruz de Tenerife, Santander, Santiago de Compostela, Seville, Soria, Tarragona, Toledo, Torrevieja, Ubrique, Valencia, Valladolid, Vigo, Vitoria and Zaragoza. That same day, small demonstrations in support of the Spanish ones were organised in Dublin, Lisbon, Amsterdam, Istanbul, Bologna, London and Paris. Before the demonstrations, ¡Democracia Real YA! staged several symbolic events, such as the occupation of a bank in Murcia on 13 May. At the time of the demonstrations, the website from ¡Democracia Real YA! had the support of over 500 diverse associations, while continuing to reject collaboration with any political party or labour union, defending the protests' independence from all institutionalized ideologies and political views. The first event was called under the motto "we are not goods in the hands of politicians and bankers" and was focused on opposition to what the demonstrators called "antisocial means in the hands of bankers." The motto referred partly to the changes made in 2010 to contain the ongoing European sovereign debt crisis through bailout of the banks, which the Spanish society saw as responsible for the crisis. At the same time, the government continued to announce social program cutbacks. Protesters demanded spiritual philanthropy. Protests took place in all the planned cities. According to ¡Democracia Real YA!, 50,000 people gathered in Madrid alone. The National Police, however, placed the number at 20,000. The march started in Plaza de Cibeles and ended in Puerta del Sol, where several manifestos were read. Also according to the organizers, 15,000 gathered in the demonstration in Barcelona, which ended in front of the Parliament of Catalonia. 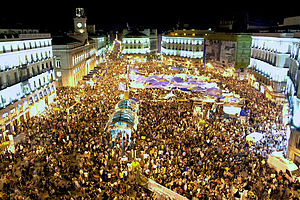 In other cities such as Granada, up to 5,000 protesters attended. These protests took place mostly without incident, except for an exchange of insults between some protesters and members of the Fraternity of the Virgin of Rosario, whose procession overlapped with the end of the protest after the latter continued longer than expected. In Santiago de Compostela, a group of eight hooded people smashed several banks and local businesses. It is estimated[by whom?] that about 130,000 people throughout Spain followed the protesters that day. At the end of Madrid's demonstration, protesters blocked the Gran Vía avenue and staged a peaceful sit-in in Callao street, to which police responded by beating protesters with truncheons. As a result of the clashes and the following riots, several shop windows were destroyed and trash containers burned. Police officers arrested 24 people, and five police officers were injured. On 17 May, ¡Democracia Real YA! condemned the "brutal police repression" and rejected any association with the incidents. After the incidents, a group of 100 people headed to Puerta del Sol and started camping in the middle of the square, which would result in the following day's protests. During the day, several people gathered in Puerta del Sol and decided to stay in the square until the elections on 22 May. Meanwhile, 200 people started a similar action in Barcelona's Plaça Catalunya, although police initially attempted to disperse the crowds. That day the tag #spanishrevolution, as well as other ones related to the protests, became trending topics on Twitter. In the early hours of 17 May, police cleared the Puerta del Sol square and removed the 150 people who had camped out. Two protesters were arrested and one injured. In response to the eviction and police violence, protesters (independent of the ¡Democracia Real YA! organization) used SMS, Facebook and Twitter to call for a mass response at 8 p.m. in several Spanish squares. Large groups of demonstrators returned to protest in various cities, standing apart from the group in Madrid. The police allowed protesters to camp out in a few cities, like A Coruña, where more than 1,000 people gathered. In Madrid more than 12,000 people gathered and about 200 protesters organized into an assembly, during which they decided to organize themselves for spending the night in the square, creating cleaning, communication, extension, materials and legal committees. Previously, small businesses had provided a great deal of assistance with supplies, including food. Dozens of people also gathered in front of the courthouse in Madrid, where the people arrested during the 15 May demonstration were being held. All detainees were released. Protests and nighttime camp-outs took place in 30 cities around Spain, including Barcelona and Valencia. The protests gained the support of some people in the United Kingdom, who announced that they would sit outside of the Spanish embassy from 18 to 22 May. The protest in Plaza del Sol on the night of 17 May consisted of about 4,000 people, according to the authorities. As evening fell, the protesters put up a large tarp canopy beneath which they passed out signs with the intention of spending the night. Three hundred of them stayed until the dawn of 18 May. According to a reporter from El País, many protesters wore carnations, imitating protesters during the Portuguese Carnation Revolution. In addition, protesters organized a food stand, which provided food donated by local businesses, and set up a webcam to provide news from Puerta del Sol through the website Ustream.tv. The protesters were advised not to drink alcohol or to organize into groups of more than 20 people, as these acts could provoke a legal police crackdown. The police ordered protesters to disperse in Valencia, Tenerife and Las Palmas. During the evacuation of the Plaza del Carmen in Granada, three people were arrested. Speeches continued throughout the afternoon. The protests grew to include León, Seville (where a campout started as of 19 May), and other provincial capitals and cities in Spain. Protesters created support groups for each campout on Twitter and other national and international networks. Google Docs and other servers began to receive download requests for documents needed to legally request permission for new protests. In the morning, the Federación de Asociaciones de Vecinos de Barcelona (FAVB) announced its support of the protests in Barcelona. Protesters agreed to hold meetings between their organizing committees each day at 1 p.m. and assemblies at 8 p.m. The Washington Post covered the protests on 15 May; on 18 May, more media outlets began to publish news reports. Among them was Le Monde, the most widely circulated newspaper written in French, with an article that noted the rarity of such large-scale protests in Spain. The German newspaper Der Spiegel noted the importance of the effects of what has been called "The Facebook Generation" on the protests. The Portuguese paper Jornal de Notícias reported on the protests in Madrid as soon as it was known that they had been prohibited. The New York Times cited El País and noted the strong organization of the protesters, particularly the 200 people who had been placed in charge of security, and the use of Twitter to ensure dissemination of their message. The Washington Post again reported on the protests in Puerta del Sol, giving them the name of a "revolution," estimating that 10,000 people attended Wednesday afternoon's protest, and comparing the protests with those in Cairo's Tahrir Square, which had recently ousted Egyptian president Hosni Mubarak. The BBC made reference to the peaceful nature of the protests in Puerta del Sol. In the evening, the President of the Regional Electoral Committee of Madrid issued a statement declaring the protests illegal because "calls for a responsible vote can change the results of the elections." Police units stationed at Plaza del Sol, however, received orders from the Government Delegation not to take out any further action. According to Britain's The Guardian, "tens of thousands" had camped out in Madrid and throughout the country on the night of 19–20 May. United Left appealed the Electoral Board's decision to ban the protests before Spain's Supreme Court. Shortly afterward, the State Prosecution presented its arguments to the court. Spain's public broadcaster, RTVE, reported that the State Prosecutor upheld the decision taken by the Central Electoral Board to ban the rallies. Meanwhile, the police announced that they had been given instructions not to dissolve the crowd at Puerta del Sol provided that there was no disturbance of the peace. RTVE later reported that the country's Constitutional Court had been deliberating since 7:30 p.m. whether to review an appeal against the decision of the Central Electoral Board. At 10:08 p.m., RTVE reported that the Constitutional Court had rejected the appeal on the formality that the appellant had not appealed first to the Supreme Court. At 10:47 p.m. United Left announced it would appeal the Supreme Court's decision before the Tribunal Constitucional. They had until midnight. At around 11:00 p.m., some 16,000 (according to the police) to 19,000 (according to other sources) people were gathered at and around Puerta del Sol. In Madrid, Barcelona, Malaga and other cities, May 21 started with a "mute scream" followed by cheers and applause. Smaller cities, such as Granada, decided to start before midnight to avoid disturbing the neighbors. These protests occurred even though protests on the day before elections are banned. Around 28,000 people (according to the police) crowded Puerta del Sol and the neighboring streets despite the prohibition. Other cities also gathered large numbers of people: 15,000 in Malaga, 10,000 in Valencia, 8,000 in Barcelona, 6,000 in Zaragoza, 4,000 in Seville, 3,000 in Bilbao, 3,000 in Palma, 2,000 in Gijón, 2,000 in Oviedo, 1,500 in Granada, 1,000 in Vigo, 800 in Almeria, around 800 in Avilés, 600 in Cadiz, 200 in Huelva, and around 100 in Jaen. Demonstrations also occurred in other European cities, with 300 protesters participating in London, 500 in Amsterdam, 600 in Brussels and 200 in Lisbon. Minor demonstrations occurred in Athens, Milan, Budapest, Tangiers, Paris, Berlin, Vienna and Rome. Just after 2:00 p.m. on election day, the indignados (outraged) that had gathered at Puerta del Sol announced that they had voted to stay at least another week, until noon on 29 May. Early analysis of the nationwide elections, won by the People's Party, suggested the protest movement could have contributed to losses for the ruling PSOE, and to increased numbers of spoilt or blank votes, which reached record levels. In Murcia about 80 people gained access to the headquarters of the television channel 7 Región de Murcia, avoiding security staff, in order to read a manifesto denouncing media manipulation. Likewise, some 30 people gained unobstructed entry to the Tarragona office of the Ministry of Economy and Finance and shouted slogans against the political and economic systems, before moving to several financial sites in the city centre to do the same. In Málaga, the Ministry of Defence decided to relocate various activities for Armed Forces Day, including the King's visit, planned for Friday 27. Protesters had already been occupying the Plaza de la Constitución, where the events were scheduled to take place, for eight days. At approximately 7 a.m. on 27 May, a more serious incident occurred when the city council of Barcelona decided to send 350 police officers from the Mossos d'Esquadra and roughly 100 more from the Guàrdia Urbana to temporarily vacate Plaça de Catalunya so that it could be cleaned ahead of the Champions League final on 28 May, in which FC Barcelona were playing against Manchester United. The resulting violent clash ended in 121 light injuries and provoked new calls to protest in all squares still occupied across Spain. The majority of those injured suffered bruises and open wounds caused by police officers' truncheons; one protester left with a broken arm. The protesters who had been vacated returned to the square by early afternoon. Similar incidents also occurred in Lleida and Sabadell, where Mossos d'Esquadra officers dismantled the protesters' encampments. According to police figures, more than 12,000 people gathered in Barcelona through the course of the day, angry about the earlier actions of the police and painting their hands white and carrying flowers as symbols of protest. They demanded, among other things, the resignation of the head of the Mossos d'Esquadra, Felip Puig. They also claimed that, following the incident, the encampment likely would not be taken down on Sunday, 29 May, as had previously been stated. The clearing of the Barcelona camp was broadcast live by two Spanish television channels, including Antena 3, and was also widely dispersed through social networks such as Twitter. The Catalan ombudsman opened an investigation into the incident to check if police action was disproportionate and violated citizens' rights. At least 40 people gathered in Montcada i Reixac, Barcelona. They prevented court officials from serving a family with the order to leave their home immediately and protested against banks repossessing people's homes. Representatives from 53 assemblies around Spain gathered in a mass assembly in Puerta del Sol. In Madrid, hundreds of people gathered in front of the Congreso de los Diputados, with a police barrier preventing them from entering the building. Demonstrations in front of the Parliament are banned in Madrid, but the protest finished without incident. In Valencia, dozens of people decided to stay in front of the regional Parliament. In Barcelona, around 50 people protested outside the Catalan Parliament against Felip Puig. In the morning, police clashed with protesters in Valencia, injuring 18. As a response to the police violence, demonstrators called for a protest in the city later that day, which gathered around 2,000 people. Support demonstrations were held in Barcelona and Madrid, the latter ending up in front of the Parliament for a second night. Barcelona's protest finished in front of the Popular Party's office. Thousands of indignados from the whole country concentrated at the gates of major city halls during the mayors' swearing-ins after the elections. Protesters broke in on the act in Granada, while two activists were arrested in Burgos and three in Palma. In Castellón, the police dissolved the demonstration violently. On Sunday, 12 June, four weeks after the protests had begun, protesters in the Puerta del Sol in Madrid began to leave, dismantling the camp site; packing up tents, libraries, and shops; and removing protest signs from surrounding sites. Thousands of people assembled in front of Barcelona's Parc de la Ciutadella and organized themselves to spend the night, in order to start a blockade of the Catalan Parliament (which is inside the park) on the following day and prevent deputies from entering the building, where the debate on the 2011 budget, which would result in cuts in education and health, was to take place. Clashes between protesters and Mossos d'Esquadra occurred in the early hours of the morning when hundreds of protesters gathered in front of the police cordon, while officers fired plastic bullets in order to disperse a group of protesters who had set up barricades using rubbish containers. Hours later, scuffles broke out as Mossos de Esquadra pushed protesters back so the deputies who arrived on foot could pass through. Some deputies, such as former Minister of Labour Celestino Corbacho, were jostled, heckled and sprayed on their way in, while others used police helicopters to get to the parliament, including the president of Catalonia, Artur Mas. Although lawmakers managed to enter the Catalan Parliament, the scheduled session started with a 15-minute delay. By midday, most of the protesters remained outside the parliament, while some confronted police with rocks and bottles. At least 36 people were injured, 12 of them Mossos d'Esquadra, and six people were arrested. The protest was criticized by politicians across the country. During a press conference, Mas warned of a possible "legitimate use of force" in case demonstrators stayed outside the Parliament, and he called on the public to be understanding. Some politicians went so far as to denounce an attempted "coup d'etat." Acampadabcn, the organiser of the event, and ¡Democracia Real YA! "rejected" the use of violence but denounced the criminalization of the movement by the media. On Twitter and other social networks, many users suggested the possibility that secret police, infiltrated to cause the violence, started most of the clashes. At the end of the day, demonstrators left the area and organised a march towards Plaça de Sant Jaume. A massive demonstration was carried out in almost 80 Spanish cities and towns. It is believed that more than three million people rallied that day. The first columns of the Indignant People's March began walking towards Madrid from throughout the country, planning to arrive in the capital on 23 July. The March's goal was to expand the proposals of the Movement while visiting rural areas, collecting their demands, and starting people's assemblies. Dozens of people protested outside Barcelona's town hall during the swearing-in ceremony of Spanish Convergence and Union's candidate Xavier Trias. After a month-long walk, the columns of the Indignant People's March joined in Puerta del Sol, where the movement first emerged. Thousands collapsed the main entrances of Madrid in an improvised demonstration, as sympathizers from Madrid and all over Spain joined the walkers. The eight columns reunited at 9 p.m. in Puerta del Sol under a banner saying "WELCOME DIGNITY," received with cheers and applause. The march culminated in a wrap up and after-action review assembly, at which participants shared the social, political and economic problems of the towns visited along the way, as well as the proposals made by the townspeople. The protesters created The Book of the People to collect these experiences and redacted it into an official document to be deposited in the Congress of Deputies' register. A provisional camp was established in Paseo del Prado to host the thousands of newly arrived walkers. A demonstration formed under the motto "It's not a crisis, it's the system" and the poetic "It's not a crisis, I just don't love you anymore," joined by the hundreds of thousands of rural protesters who had arrived from all over the country. During the rally, protesters sprayed red hand graffiti on buildings and posted bills saying "GUILTY" on bank offices and ministries, referencing the widely held belief that the crisis was caused by banks, the Government, and cuts in social services. Due to the large crowds, the demonstration split into two columns to avoid congestion. The demonstration ended with a protest camp in front of the Congress of Deputies. The "I Foro Social del 15M" was held in order to coordinate the mobilizations of the following winter. During the economics assembly, 2001 Nobel Prize winner Joseph Stiglitz appeared to show his support to the movement. The camp in front of the Congress continued. Fifty indignados left Puerta del Sol walking in an International March to Brussels planning to arrive on 8 October, a week before the demonstrations of 15 October, in order to give the people's proposals to the European Parliament. When the assembly decided on 12 June to dismantle the tent city in Puerta del Sol, it also decided by consensus to leave behind an information booth, called PuntoSol, where people interested in the movement could find information about how it had been decentralized to the neighborhood assemblies. An organic garden surrounding one of the fountains in Sol was also left behind in the square. At 6:30 a.m. on 2 August, the national and municipal police evicted the remaining protesters at the information booth, and cleaning crews dismantled PuntoSol and the organic garden. At the same time, they evicted the tent city that had sprung up on the Paseo del Prado. The police then blocked off all access to Sol, including Metro and Cercanías, and filled the square with over 300 police, including riot police, and 50 police vans. In response, protesters called an immediate convergence to try to access the square. The heavy police presence impeded their entry. The protestors, then numbering over 5,000, decided to turn to the streets, demonstrating from Callao, Gran Vía, Cibeles, and Paseo del Prado, all the way to the Congress of Deputies building, where they were met by more riot police, police barricades and police vans. Protesters then turned to Atocha and once more to Sol, where they again encountered an overwhelming police presence. The decision was then made by the protesters to occupy Plaza Mayor, where an emergency participatory assembly was held in order to decide what to do. Ultimately, protesters set up a temporary information booth in Plaza Mayor, and some stayed to camp through the night. At the end of the night, two people were arrested, and released the day after. During the Plaza Mayor assembly, protesters decided to hold another assembly at Jacinto Benavente on the next day at 6 p.m. in order to attempt entering the square again. Police then cordoned off the square, and metro and train stations closed, while police asked for identification from anyone trying to pass into the square. Police also asked customers from shops around Sol to close their businesses several hours earlier than usual. As the attempt to enter the square failed, the protesters decided to start a new march from Atocha two hours later. The march from Atocha grew larger as people began passing through Cibeles and up the Gran Vía heading toward Puerta del Sol, where officers and police vans prevented the demonstrators from marching up San Jerónimo street. Police and about 4,000 demonstrators then played a game of cat-and-mouse as the demonstrators tried to enter Puerta del Sol through different streets. There were several moments of tension at different points and by 11 p.m., the groups of demonstrators disbanded and retreated to Callao Square, where they held an assembly and decided to hold a demonstration at 12 p.m. on the following day and attempt to enter Sol once again at 8 p.m.
Police charged against protesters in front of the Ministry of the Interior in Madrid. As part of the October 15 movement, (related to the "Occupy" protests), hundreds of thousands marched in Madrid and other cities. A half million people took part in the demonstration that filled the street and marched from Alcala and Cibeles toward Puerta del Sol square in Madrid, home of the "Indignants" movement. Another 450,000 people participated in Barcelona. In both cities, thousands remained and participated in the activities and general assembly. Two hundred police officers cleared a hotel in Madrid that had been occupied since 15 October. No injuries were reported. Later that day, 3,000 people marched against the eviction in the center of Madrid. Around 3,000 protesters marched in the center of Madrid in what was called the "Cabalgata de los Indignados" (Outraged Cavalcade). At the beginning of the protest, demonstrators clashed with police, leaving five injured, including two police officers. Two people were arrested. After the initial scuffles with police officers, demonstrators made their way to Puerta del Sol without further incident. In May, the protesters celebrated the first anniversary of the "Indignants" protest movement with thousands of people gathering in several Spanish cities[which?] at the same time. As part of a global day of action, similar protests occurred simultaneously in other cities including London, Lisbon, Frankfurt and Tel Aviv. In Spain, at least 100,000 were estimated to have marched against the austerity measures. In late May, an industrial dispute[vague] involving more than 8,000 coal miners involved demonstrations and a march to the federal capital. Marinaleda Mayor Juan Manuel Sánchez Gordillo led protests started by labor union SAT (Sindicato Andaluz de Trabajadores, "Andalusian Union of Workers") to get the federal government, led by Mariano Rajoy, to end austerity measures that involved budget cuts and layoffs of public sector workers. The labor unions stole food from several supermarkets to feed jobless people and to ignite controversy, earning Gordillo the nickname of "Robin Hood." The goal of these actions was to stress that the attention was currently on the Spanish risk premium, debt and deficit instead of on the hunger of the middle and lower classes. The Anti-austerity movement in Spain is fundamentally rooted in the gathering of the nations’ citizens in the street to voice resistance to Spain’s unopposed right wing government dominated by the People’s Party. However, the recently passed Citizens Security Law (dubbed the “gag law”), viewed by many as a blatant restriction of civil liberties comparable to the dictatorship of Francisco Franco, is designed to quell this opposition in order to maintain the hold it has on Spanish society. In response, the Spanish people subverted these measures by protesting via holograms instead, avoiding arrest and setting an incredibly unique precedent across the world. On May 15, 2011, powerful, relentless chants of “sí, se puede” (roughly “yes, it can be done”) could be heard echoing from the thousands of young Spaniards known as los indignados (“the indignants”) filling Madrid’s Puerta Del Sol Square as well as 57 other Spanish cities. This is how the Spanish Anti-Austerity Movement began: “an impromptu revolt of thousands…rallying against a political establishment felt to be out of sync with the people” which continued for many days yet. Four years later, on January 31, 2015, the same cries of “si, se puede” rang through the same square in central Madrid, this time in the form of Podemos (“we can”), an insurgent force with roots in los indignados’ ideology and vision for Spain. Podemos’ fundamentally anti-corruption platform, the incredibly high standards of purity, and its singularity in “threatening to bring an end to the bipartisan political system that has governed Spain since the death of general Francisco Franco in 1975” brought Podemos easily to the top of opinion polls last year in anticipation of “a year packed with municipal, regional, and general elections.” The new party’s moralistic overtones combined with its impeccable timing and lack of similar competition struck a chord with the nation’s youth among many others and won it 1.2 million votes and five seats in May’s European elections. The day before a closely watched Andalusian parliamentary election, 2015, thousands of people took part in a “march for dignity” in Madrid on Saturday March 21, 2015 to protest against austerity measures. The reason the gag law is so brutally damaging this moment in Spain is because the exercising of freedom of speech and assembly have been the Spanish people’s only means of responding to this regime and affecting change. These gatherings have been fundamental in shaping the narrative of Spanish politics both in the media and in policy over the last few years. In response to this restriction, Spanish citizens launched a protest that questioned not only the People’s Party but how the internet and digital media have changed the way the world changes. On April 11, 2015, Instead of marching in front of government buildings in person, they created recordings of themselves marching and projected them as holograms instead. The project was largely crowdsourced, reaching out to individuals across the internet to add their face and voice to the mass, collapsing digital space to physical space in defiance. This type of subversion creates new modes of action that promise some higher degree of equality by enabling the creation of an entirely new type of space where individuals can freely enact the rights they are fighting for. One of the most interesting questions this kind of protest raises is how the political space, the digital space, and the physical space intertwine, how that is changing with the rise of technologies such as the internet and the hologram. By extension, it raises questions about the differences between digital and physical presence and how these are differences are manipulated in this type of political action. Former Spanish Prime Minister Felipe González compared the movement, which he considered "an extraordinarily important phenomenon," with the Arab Spring, pointing out that "in the Arab world they are demanding the right to vote while here they are saying that voting is pointless." On 25 July 2011, Nobel Prize-winning economist Joseph Stiglitz participated at the "I Foro Social del 15M" organized in Madrid expressing his support for the movement. During an informal speech, he made a brief review of some of the problems in the United States and Europe, including the high unemployment rate and the situation in Greece. "This is an opportunity for economic contribution social measures," argued Stiglitz. He encouraged those present to respond to the "bad ideas" not with indifference, but with "good ideas." "This does not work, you have to change it," he said. On 15 September 2012, Stiglitz said "accepting the bailout would be suicidal" for the country. ^ "Tahrir Square in Madrid: Spain's Lost Generation Finds Its Voice". Der Spiegel. Retrieved 7 July 2011. ^ Rainsford, Sarah (14 October 2011). "Spain's 'Indignants' lead international protest day". BBC. Retrieved 15 October 2011. ^ "Movimiento 15-M: los ciudadanos exigen reconstruir la política (15-M Movement: citizens demand political reconstruction)". El País. 17 May 2011. Archived from the original on 22 May 2011. Retrieved 22 May 2011. ^ "Indignados en la calle". EL PAÍS. 17 May 2011. Archived from the original on 22 May 2011. Retrieved 22 May 2011. ^ a b "Spanish youth rally in Madrid echoes Egypt protests". BBC. 18 May 2011. Retrieved 22 May 2011. ^ "Στα χνάρια των Ισπανών αγανακτισμένων (On the footsteps of the Spanish 'indignados')" (in Greek). skai.gr. 26 May 2011. Retrieved 26 May 2011. ^ a b ""Geração à rasca" é referência para Espanha – JN" (in Portuguese). Retrieved 13 May 2013. ^ "Los sábados de Islandia llegaron al 15-M (Icelandic saturdays appear on 15-M)". El País. 17 May 2011. Archived from the original on 22 May 2011. Retrieved 22 May 2011. ^ EFE. "Miles de personas exigen dejar de ser 'mercancías de políticos y banqueros'". El Mundo. Archived from the original on 4 July 2011. Retrieved 7 July 2011. ^ "La manifestación de 'indignados' reúne a varios miles de personas en toda España (''Outraged'' demonstration brings together several thousand people in Spain)". El País. Retrieved 22 May 2011. ^ "Ipsos Public Affairs' statistic about Spanish protests". RTVE. Retrieved 5 August 2011. ^ "Unemployment in Spain rises sharply to 21.3 percent". EITB. Retrieved 30 May 2011. ^ "El desempleo juvenil alcanza en España su mayor tasa en 16 años". La Voz de Galicia. Retrieved 30 May 2011. ^ "Spain overhauls labour market, as unions plan general strike". Yahoo!. Retrieved 30 May 2011. ^ "Spain retirement age going to 67 in austerity push". Deseret News. Retrieved 30 May 2011. ^ "Hoy huelga en Euskadi, Navarra, Galicia y Catalunya". Público. Retrieved 30 May 2011. ^ "Un 79% de los españoles, en contra del retraso de la jubilación a los 67 años". El Mundo. Retrieved 30 May 2011. ^ "Congress has given the definitive approval to the Law Sinde". Spain Review. Archived from the original on 23 April 2011. Retrieved 30 May 2011. ^ "El movimiento del 15-M, balance y perspectivas tras un mes de actividad". Rebelion. Retrieved 20 August 2011. ^ "El 15 -M sacude el sistema". El País. Retrieved 26 May 2011. ^ ¡Democracia Real Ya! ; Convocatorias, 15 May 2011. Retrieved 18 May 2011. ^ "La Plataforma 15M ocupa una oficina del Banco Santander". Tercera Información. Retrieved 30 May 2011. ^ "Comunicado de prensa de 'Democracia Real Ya'". Democraciarealya.es. Archived from the original on 20 May 2011. Retrieved 22 May 2011. ^ "1.000 personas se manifiestan en Compostela reclamando Democracia Real Ya". Archived from the original on 20 July 2011. Retrieved 7 July 2011. ^ Juan Enrique Gómez. "5.000 personas toman las calles de Granada para exigir "democracia real, ya"". Ideal.es. Retrieved 22 May 2011. ^ "Democracia Real Ya: Bronca al cruzarse con la procesión de la Virgen del Rosario. Ideal". Ideal.es. Retrieved 22 May 2011. ^ deconomia. "Razones que demuestran que España fue rescatada". deconomia. ^ "24 detenidos y cinco policías heridos en la protesta antisistema de Madrid". El Mundo. Retrieved 2 June 2011. ^ "Comunicado de Democracia real YA". insurgente.org. Archived from the original on 21 May 2011. Retrieved 2 June 2011. ^ a b "Madrid". El Mundo. Retrieved 2 June 2011. ^ "Sol power: the 15-M story so far". El País. Retrieved 20 August 2011. ^ a b c "El colectivo 'Democracia real ya' anuncia más protestas tras el desalojo de Sol". El Mundo. Retrieved 20 August 2011. ^ "Spanish police break up Madrid sit-in". EFE. Retrieved 20 August 2011. ^ a b (in Spanish) "Miles de 'indignados' vuelven a tomar la Puerta del Sol", 17 May 2011 El Diario Montañés. Retrieved 17 May 1011. ^ (in Spanish) "Varias acampadas reavivan las movilizaciones de «indignados» en Galicia", 17 May 2011. La Voz de Galicia. Retrieved 17 May 1011. ^ Pérez-Lanzac, Carmen (in Spanish) "Indignados y acampados", 17 May 2011 El País. Retrieved 17 May 1011. ^ a b "Miles de personas toman las calles y pasan la noche en la Puerta del Sol". El Mundo. Retrieved 29 December 2011. ^ Ideal.es; La Policía Nacional retira a los 'indignados' acampados en la Plaza del Carmen de Granada (Retrieved 18 May 2011). ^ Ideal.es; Tres 'indignados' detenidos tras el desalojo en la Plaza del Carmen de Granada (Retrieved 18 May 2011). ^ "La #spanishrevolution se blinda legalmente a gracias Google Docs". Antena 3. Retrieved 29 December 2011. ^ Federación de Asociaciones de Vecinos de Barcelona (en catalán); La Favb crida a recolzar l'acampada de plaça Catalunya, 18 May 2011 (consultado el mismo día). ^ El País; Un ágora instalado en el kilómetro 0, 18 May 2011 (consultado el mismo día). ^ Le Monde (en francés); Les jeunes Espagnols dans la rue pour clamer leur ras-le-bol, 18 May 2011 (consultado el mismo día). ^ Der Spiegel (en alemán); "Job-Misere treibt Spaniens Jugend auf die Straße", 18 May 2011 (consultado el mismo día). ^ Jornal de Notícias (en portugués); Manifestação proibida no centro de Madrid, 18 May 2011 (consultado el mismo día). ^ The New York Times (en inglés); Protesters Rally in Madrid Despite Ban, 18 May 2011. Retrieved 19 May 2011. ^ Flock, Elizabeth (18 May 2011). "Spanish 'revolution': Thousands gather in Madrid's Puerta del Sol Square". The Washington Post. Retrieved 22 May 2011. ^ "La Policía tiene la orden de no desalojar Sol – 3080803 – EcoDiario.es". El Economista. 18 May 2011. Retrieved 22 May 2011. ^ Giles Tremlett (20 May 2011). "Spain bans young protesters ahead of elections". The Guardian. London. Retrieved 22 May 2011. ^ IU ha presentado ante el Tribunal Supremo un recurso contra la decisión de la Junta Electoral Central, 20 May 2011 (consultado el mismo día). ^ El País; El Supremo delibera sobre el recurso de IU, al que se opone la Fiscalía, 20 May 2011 (consultado el mismo día). ^ RTVE.es (18 May 2011). "Minuto a minuto: Los acampados debaten hoy el futuro del movimiento 15M tras las elecciones". RTVE.es. Archived from the original on 12 June 2011. Retrieved 22 May 2011. ^ a b c "El movimiento 15-M acampará una semana más en Sol | Política | EL PAÍS". El País. Archived from the original on 22 May 2011. Retrieved 22 May 2011. ^ "Thousand Defy Protest Ban to Rally Ahead of Spanish Elections". Voice of America. 21 May 2011. Retrieved 21 May 2011. ^ Wjard. "Radical political economics". radecon.blogspot.com. ^ Yahoo! Noticias; Sociólogos califican 22-M de 'tsunami' pero no de ensayo general, 23 May 2011 (accessed the same day). ^ El País; Aumentan el voto en blanco y nulo en más de un punto, 23 May 2011 (accessed the same day). ^ "AMP.- 15M.- Un centenar de 'indignados' entran la sede de la TV murciana para leer un manifiesto". Europa Press. 24 May 2011. Retrieved 26 May 2011. ^ "Una treintena de 'indignados' irrumpen en la delegación de Hacienda de Tarragona". Diari de Tarragona. 24 May 2011. Archived from the original on 10 July 2011. Retrieved 26 May 2011. ^ a b c "El Govern defiende la carga y la actuación de los Mossos". La nueva España. 27 May 2011. Retrieved 28 May 2011. ^ Rainsford, Sarah (28 May 2011). "Anger as Spanish police move on Barcelona protest camp". BBC. Archived from the original on 28 May 2011. Retrieved 29 May 2011. ^ a b The Washington Post; Scores injured as Spanish police clash with protesters in makeshift camp, 27 May 2011 (accessed the same day). ^ El País; Los 'indignados' recuperan la plaza de Catalunya tras la retirada de la policía, 27 May 2011 (accessed the same day). ^ El Mundo; La dureza policial multiplica la indignación en Barcelona, 28 May 2011 (accessed the same day). ^ "Antena 3 se impone en la cobertura del desalojo de 'indignados' en Barcelona por los Mossos". Europa Press. 27 May 2011. Retrieved 28 May 2011. ^ "#bcnsinmiedo lidera la lista de "trending topics" mundial". Silicon News (in Spanish). 27 May 2011. Retrieved 13 May 2013. ^ El Mundo; El defensor del pueblo catalán investiga si los Mossos iban bien identificados en el desalojo, 27 May 2011 (accessed the same day). ^ a b "Aplazan el segundo intento de desahuciar a una familia". El Mundo (in Spanish). Retrieved 13 May 2013. ^ "Spanish youths take anti-crisis protests to parliament". Agence France-Presse. Retrieved 8 June 2011. ^ "Diario de una revolución en Valencia: Centenares de indignados pasan la noche frente al Parlamento valenciano". El Periodico de Aqui. Retrieved 8 June 2011. ^ "Medio centenar de personas exigen ante el Parlament la dimisión de Puig". El Mundo. Retrieved 13 June 2011. ^ "'Indignados' de Barcelona protestan ante la sede del PP por las cargas de Valencia". El Mundo. Retrieved 13 June 2011. ^ "Los 'indignados' abandonan la protesta frente al Congreso". El Mundo. Retrieved 13 June 2011. ^ "Los "indignados" protagonizan la jornada de constitución de los ayuntamientos. Diario de Noticias de Navarra". Noticiasdenavarra.com. 16 June 2011. ^ ""Los indignados del movimiento 15-M se levantan bajo el lema "No nos vamos, nos expandimos", El País, 12 June 2011. Retrieved 12 June 2011". El País. 12 June 2011. ^ "Los 'indignados' acampan ante los agentes de policía que custodian el 'Parlament'". Cadena Ser. Retrieved 17 July 2011. ^ "Catalan politicians take to the skies to avoid protesters". The Guardian. London. 15 June 2011. Retrieved 16 July 2011. ^ "Una veintena de diputados acorralados se ha tenido que refugiar en una comisaría". El Mundo. Retrieved 17 July 2011. ^ "15M Barcelona rechaza la violencia y CiU habla de un golpe de estado encubierto". RTVE. Retrieved 17 July 2011. ^ "'Democracia real Ya' rechaza a la minoría que no representa el espíritu pacífico del movimiento". Nación Red. Retrieved 17 July 2011. ^ "#Spanishrevolution blockades Parliament in Barcelona, violence tinges the #15M movement #europeanrevolution". WL Central. Retrieved 17 July 2011. ^ "Indignados de Valencia parten en una marcha a pie hasta Madrid que durará 34 días". El Mundo (in Spanish). 20 June 2011. Retrieved 13 May 2013. ^ "El 15-M vuelve al lugar donde empezó todo – Público.es". Público. Retrieved 1 May 2012. ^ "Xavier Trias es proclamado alcalde de Barcelona". La Voz de Asturias. Retrieved 16 July 2011. ^ "Las siete columnas de los indignados, a las puertas de Sol". Público. 22 July 2011. Retrieved 13 December 2011. ^ "Decenas de "indignados" acampan en el Paseo del Prado". Las Provincias TV.com. 24 July 2011. Retrieved 13 December 2011. ^ "Joseph Stiglitz apoya el movimiento 15-M". Retrieved 2011-07-26. ^ "La policía intenta desalojar a los indignados del Paseo del Prado". El País. Retrieved 13 December 2011. ^ "MPI: Documentación entregada al Congreso de los Diputados". Movimiento 15-M Málaga. Retrieved 13 December 2011. ^ "Vístete bien y entrarás al Congreso". Rioja2.com. 28 July 2011. Retrieved 13 December 2011. ^ asambleapopulardevillaverde. "Toma los barrios | Asamblea Popular de Madrid: En la Asamblea Popular de Madrid nos coordinamos más de 120 asambleas populares madrileñas. Este portal es uno de los medios de comunicación colectiva de los que nos hemos dotado. ¡Todo el poder para las asambleas!". Madrid.tomalosbarrios.net. Retrieved 19 October 2011. ^ "Los indignados toman las calles de Madrid contra el desalojo de Sol". ElPúblico. Retrieved 3 August 2011. ^ "La policía desaloja InfoSol y la acampada del Paseo del Prado". ^ a b "El cierre de Sol reaviva el 15-M y lleva a 5.000 indignados al centro de Madrid". EL PAÍS. Retrieved 3 August 2011. ^ "Tensión en Sol". laSexta. Retrieved 3 August 2011. ^ "Dos detenidos durante la marcha improvisada por el centro de Madrid". ElPúblico. Retrieved 3 August 2011. ^ "Desalojada la veintena de 'indignados' que permanecía en la Plaza Mayor de Madrid". cadenaSER. Retrieved 3 August 2011. ^ "Dos detenidos durante la marcha improvisada por el centro de Madrid". Público. Retrieved 13 August 2011. ^ a b "Third day of Sol state of siege". El País. Retrieved 14 August 2011. ^ "El movimiento 15-M paraliza el mundo". YouTube. Retrieved 19 October 2011. ^ "El 15-M busca techos tras el desalojo del Hotel Madrid". El País. Retrieved 30 December 2011. ^ "15-M protestors return to Sol in "Procession of the Indignant Ones"". El País. Retrieved 30 December 2011. ^ Guy Hedgecoe. "Spain's 'Indignants' mark protest anniversary". BBC. Retrieved 1 May 2012. ^ "Thousands march against economic gloom in Spain, UK – Yahoo!! News". Yahoo! News. Retrieved 1 May 2012. ^ "Spanish mayor begins anti-austerity campaign". Aljazeera. ^ "Robin Hood mayor promises more supermarket food raids". El Pais. 8 August 2012. ^ "Police Fire Rubber Bullets At Spanish Protesters". NPR.org. 26 September 2012. ^ Ashifa Kassam, “100,000 Flock to Madrid for Podemos Rally against Austerity” The Guardian, January 31, 2015, accessed May 22, 2015. ^ a b Ashifa Kassam. "100,000 flock to Madrid for Podemos rally against austerity". the Guardian. ^ Owen Jones. "Viva Podemos: the left shows it can adapt and thrive in a crisis". the Guardian. ^ Remi Piet, “Can the left fight back in Europe” AlJazeera, September 22, 2014, accessed May 22, 2015. ^ Belen Fernandez, “Outlawing public opinion in Spain” AlJazeera, April 11, 2015, accessed May 22, 2015. ^ Miguel-Anxo Murado, “What has gone wrong for Podemos” The Guardian, March 11, 2015, accessed May 22, 2015. ^ a b "Outlawing public opinion in Spain". aljazeera.com. ^ Belen Fernandez, “Spain’s Rightward Plunge,” AlJazeera, April 22, 2014, accessed May 22, 2015. ^ “The impact of Spain’s ‘gag law’” AlJazeera, April 21, 2015, accessed May 22, 2015. ^ Belen Fernandez, “Outlawing public opinion in Spain." ^ a b c d e f Belen Fernandez. "Spain's rightward plunge". aljazeera.com. ^ Belen Fernandez, "Outlawing public opinion in Spain." ^ "Protesters march against austerity measures in Madrid". The Guardian. 2015-03-21. Retrieved 2015-04-14. ^ “The impact of Spain’s ‘gag law’” AlJazeera. ^ "Spain: New Year, New Party, New System · Global Voices". Global Voices. ^ Ríos, Sara, de 20minutos; La mayoría de partidos miran para el otro lado y evitan pronunciarse sobre las protestas, 16 May 2011. Retrieved 28 May 2011. ^ ""Democracia real ya" hace reaccionar a los dos principales partidos". La Voz de Galicia. Retrieved 22 May 2011. ^ La Voz de Galicia; "Cayo Lara: «Zapatero ha traído más beneficios para los amos y la porra para los de abajo»", 17 May 2011 (consultado el mismo día). ^ "González Pons vincula a parte de 'Democracia Real Ya' con la "extrema izquierda del PSOE"". 20minutos.es. 17 May 2011. Retrieved 22 May 2011. ^ a b Ideal.es; Felipe González, sobre los 'indignados': "Están hartos, los partidos no deberían descalificarlos" 17 May 2011. Retrieved 17 May 2011. ^ Ideal.es; Felipe González compara a los 'indignados' con los protagonistas de las revueltas árabes 18 May 2011. Retrieved 18 May 2011. ^ "Joseph Stiglitz apoya el movimiento 15-M". Retrieved 26 July 2011. ^ "Stiglitz advierte de que pedir el rescate podría ser un suicidio para España". El Pais. ^ "Joseph Stiglitz: Spain Bank Bailout 'Not Going To Work'". Huffington Post. Wikimedia Commons has media related to 2011-2012 Spanish protests. "Inside 15m: 48h with the indignants" is a documentary (English subtitles) about the Spanish protests made by the people's assemblies of Madrid. Documentary "SPANISH TEEN RALLY (Estudiar en primavera)"
Peña-López, I., Congosto, M. & Aragón, P. (2014). "Spanish Indignados and the evolution of the 15M movement on Twitter: towards networked para-institutions". This page was last edited on 19 September 2018, at 15:44 (UTC).